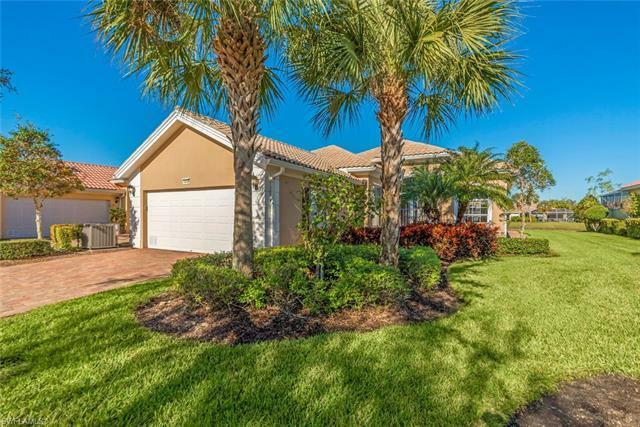 15436 Puffin Dr, Bonita Springs, FL.| MLS# 219007467 | Southwest Florida Residential Real Estate for Sale. H.14166 - Rarely available extended Oakmont situated on an oversized lot. The tiled entry portico is screened to let you enjoy the tropical breezes we are so famous for in Southwest Florida. This entry screen also makes it much easier to keep your entry area free of debris. This beautiful home has a large living area surrounded by sliding glass doors. The hickory wood flooring runs throughout the living area and into the owner's suite and really adds warmth to this home. The pull down shades on the sliders and windows let you enjoy all the views without the obstruction of blinds. The layout of this home keep secondary bedrooms and bath toward the front of the home, and the owner's suite at the rear. Crown moulding and wainscoting highlight this home and add to the cozy feeling. All closets have"California" style inserts with adjustable rods and shelving to meet your individual needs. Owner's suite has 3 clothes closets and a linen closet. All walls are finished smooth in the event you want to hang wallpaper or use paint with a sheen. The owner's suite has impact glass slider access to the screen patio and the view! New A/C 2017, patio rescreen 2016. Exterior freshly painted.